Dharma Day – July 3rd « Dr Deborah Swallow – Global Cultural Diversity.. This widely spread Buddhist saying captures the essence of Dharma day: a day to celebrate the first teachings of Buddha. 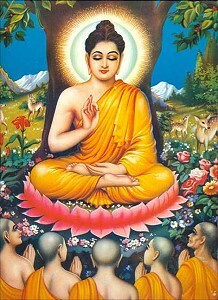 The word Dharma translates to ‘truth’ or to ‘the way to enlightenment.’ This date, every full moon of July, marks the day in Siddhartha’s life when he, right after his enlightenment, sought out his five original disciples and begun teaching them what he had learned. This day is also known as Dharmachakra, or the First Turning of the Wheel of Dharma, which implies that Dharma day was the day the Buddhist fate begun to form and spread. In ancient times, the Dharma day also used to mark the beginning of rainy season… The rainy season used to be the only time in a year when the normally nomadic nuns and monks settled down for three months to take shelter, but also to further meditate and reflect on life. After the rainy season, the nuns and monks would continue their travel and pass on more of Buddha’s teachings. Today, Dharma day is an important day to reflect upon readings from Buddhist scriptures. If possible, Dharma day is celebrated in a temple, or in presence of nuns and monks. In addition to reading scriptures, the day is often used to clean temple areas and monasteries, and to meditate. To end, here is a quote by a wise thinker that will, perhaps, make us all contemplate a little. This entry was posted on Tuesday, July 3rd, 2012 at 9:10 am and is filed under days of significance, East Asia, General, other interesting stuff, social practices . You can follow any responses to this entry through the RSS 2.0 feed. Both comments and pings are currently closed.